Motorola Droid 4 Coming December 8th? The Samsung Galaxy Nexus is rumored to launch the the 8th of December, and now it would appear that Verizon may be launching another Android device on the same day, the new Motorola Droid 4. 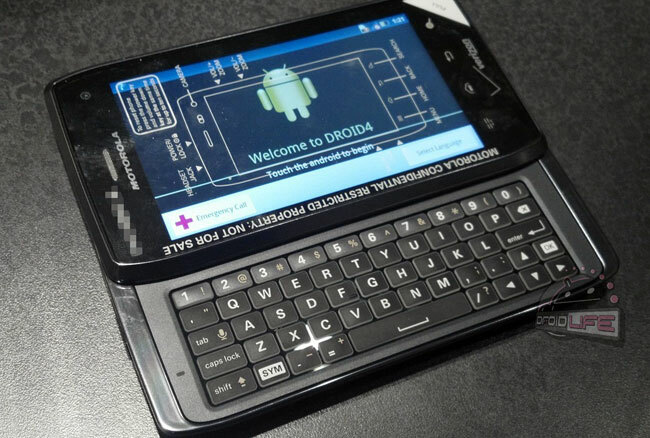 We have already seen a leaked photo and some specifications on the yet to be announced Motorola Droid 4, and the device has previously turned up in Verizon’s inventory, and it looks like it may hit Verizon on the 8th of December. The news comes from the guys over at Droid Life, who previously brought us the photo and the specifications on the Droid 4, which include a 4 inch Super AMOLED Advanced touchscreen display and a full 5 row illuminated slide out QWERTY keyboard. Other rumored specifications include Android 2.3.5 Gingerbread, 4G LTE, a front facing camera for video chat and a rear facing 8 megapixel camera which will be able to record full high definition video in 1080p. As soon as we get some confirmation that the Motorola Droid 4 will be launching on the 8th of December we will let you guys know, although we do wonder if Verizon will launch the Droid 4 on the same day that they are rumored to be launching the new Samsung Galaxy Nexus.